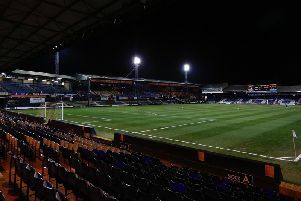 Chesterfield caretaker manager Guy Branston thought his side ‘scared Luton to death’ during their 1-0 defeat at Kenilworth Road this afternoon. Hatters’ striker Danny Hylton scored the only goal of the game after 53 minutes, but on the performance, Branston, who took the game after previous Gary Caldwell was sacked recently, said: “A big reaction for an interim manager is to see if you get a performance and I got one. “I look at the lads in the building, I asked them for effort and application for what I wanted to achieve and did we achieve it? It needs tweaks. Did we go where I wanted us to go against a top side that’s going to get promoted? “I think we scared them at times, I think we scared them to death. “The positive thing about going to the likes of Luton and being involved in a game like this is that my lads who I put out there shone for me individually, and I’m just pleased with them, I mean that. “They’re great guys, they’ve worked incredibly hard again this week and will continue to work hard until the new manager comes in.